A complete guide to getting a fantastic spectrum of colorful glazes, Linda Bloomfield looks at a full range of materials and options for creating colors in glazes. 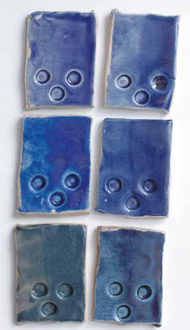 This book is illustrated with finished work as well as an extensive collection of sample test tiles to illustrate the variety of colors possible from metal oxides in ceramics. 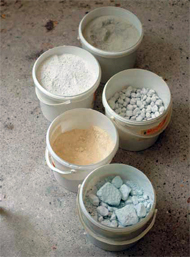 The practical aspects of mixing, applying, testing and adjusting glazes are also explained, while a large selection of glaze recipes are included for use on earthenware, stoneware and porcelain fired in electric, gas and salt kilns. A very useful book aimed at making glazes that achieve the colors you want, and to help you broaden your palette. Color is often introduced into ceramic glazes by adding commercial stains, which have been manufactured by heating together coloring oxides and opacifiers. This book shows how to make colored glazes directly from oxides, as well as showing what kinds of base glazes best bring out different colors. This knowledge is important when using commercial stains as well as coloring oxides. The book concentrates on colors used in oxidation (electric kiln) firings, where colors obtained are generally brighter, although glazes fired in reduction are included for comparison. 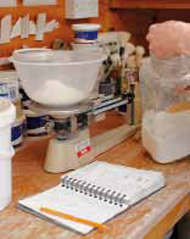 The right ingredients Bloomfield has essentially created a textbook for anyone interested in making their own glazes. 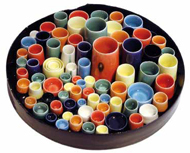 She presents a brief history of color in glazes, then discusses the principles of glaze chemistry and what role each of the glaze materials like silica, alumina, feldspars, fluxes and frits play in the making of a glaze and developing color. She has an innate sense of these materials, and her explanations are concise and offer the information you need feel comfortable experimenting on your own. Bases basics Once you understand how individual ingredients work, you’re now set to combine them to create base glazes. Do you want a glossy or matt glaze? Perhaps a crystalline or crater glaze? Just think, you could take a single color, like blue, and use it in a variety of bases that provide different textures and surface effects. And if you just want matte glazes, you can develop a matte base and add various colorants to that. Adding color Coloring oxides—cobalt, copper, iron, chrome, manganese, rutile, nickel, vanadium, rare earths—are the secret ingredients that change your glazes into a show of color. And when you can’t get the color you want from the oxides, you can turn to stains, which Linda also discusses. What Linda does best is test, so when you see 63 pages of color samples and recipes for each color group—blue, green, turquoise, purple, grey, pink, red, orange, yellow—and scores of variations. Even if you have your own favorite glaze bases, the color samples give you an idea of what oxides and stains are capable of so you don’t have to make outright guesses. No experience necessary If you’ve never mixed a glaze before, it’s really not that complicated. Once you have your materials on hand, a gram scale and a sieve, you’re on your way. Linda’s brief how-to tutorial, which includes information on health and safety, will have you concocting custom glazes in no time. 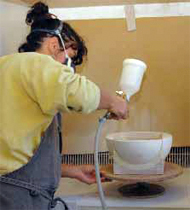 The experience you require comes with testing glazes by isolating and combining both glaze materials and colorants. 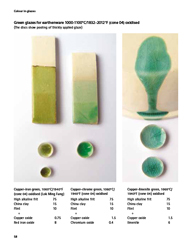 The whole enchilada Colour in Glazes contains information about glazes and glazing in general, including sections on how to apply glazes, different testing protocols, and even how to correct glaze faults. Appendices include a ceramics materials list, US-UK equivalents, glaze formula calculation, periodic table, and materials analysis for frits, clays and feldspars.